Last month a very good friend and 2 others swam in natural waterways every day in January to raise funds for children involved in the #Syrian Crisis. They did brilliantly and raised over £3000, with daily updates on Facebook to friends and family. They had plenty of people who thought they were utterly mad and donated to this excellent cause just so they didn't have to go through similar pain! I have always had a liking for water, but normally when it is a lot warmer. I had taken part, for the first time, in a charity swim on Boxing Day in the North Sea. I was the only one of my generation in the family not to have done it and they all thought it was about time I did it. Not given much choice, I duly stripped off (to my swimming costume and Christmas hat and wetsuit shoes) and meekly followed 50 others in to the north sea for a minute. It was not a pleasant experience but you do instantly bond with those around you! Not sure much swimming was done by me, more jumping up and down in time to my sharp inhalations every time my chest went under. When the one minute gun finally (it felt like an eternity) went off I rushed out. Rather than feeling frozen to the core, I surprisingly felt absolutely amazing! It is true that cold water 'swimming' does wonders for your mental state. It was freezing, literally, as we walked up to the moors that accommodate Stoodley Pike in the Calder Valley. The snow turned from slush to proper snow - good sledging up there, must take the children later. They were swimming in Gaddins Dam, an old reservoir bought by 'Friends' and made safe to swim in, complete with a 'beach'. I had been there before when my partner had been training for a triathlon and was practicing his open water swimming, in a trisuit. He had suggested a 'family picnic' on the 'beach' while watched him swim his mile. What I hadn't appreciated then was that the dam is on the top of the moor, complete with howling wind. By the time he had finished his mile, the picnic had been eaten and the children and I were huddled together, shivering. 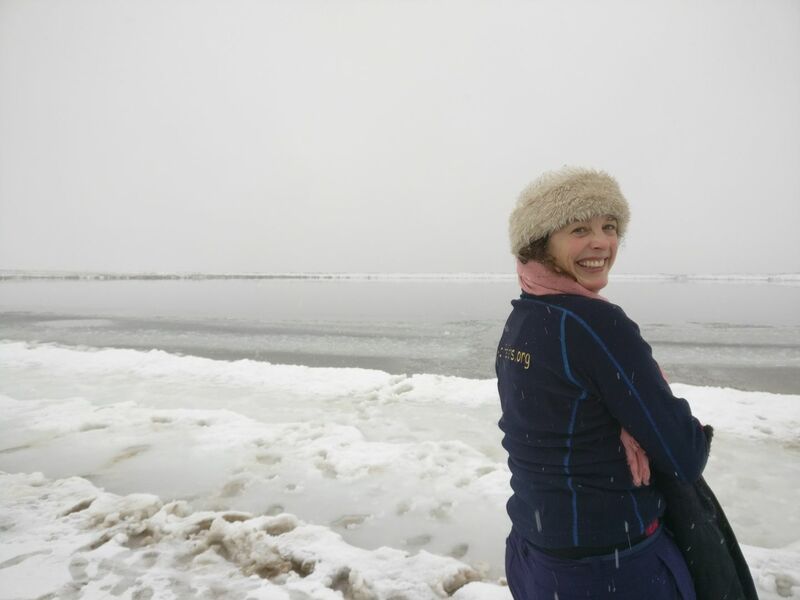 Looking over the dam wall, there was a thick layer of ice at the edges - there was no way I was going to get in that! Then in some kind of frenzied pack mentality, I just followed the others in. It was really painful breaking through the ice, even though someone else had already broken it. I confess, I didn't 'swim' but I did dip and I did get out before the others. What an achievement! I resolved to join them again but the stars didn't align until their last swim. There were about 21 of us followers and all bar 3 people swam. In the dark, in the snow, in a dam (this time not frozen!) on top of a moor in West Yorkshire. We came down in the rain and straight to a pub to celebrate. I still couldn't do it every day in January. What a challenge!